Hungarian savory palacsinta are paper-thin pancakes served rolled or folded into triangles with savory fillings like scrambled eggs and mushrooms, creamed meats, seafood, and vegetables. Palacsinta can be served as a main course, appetizer, brunch or luncheon dish. 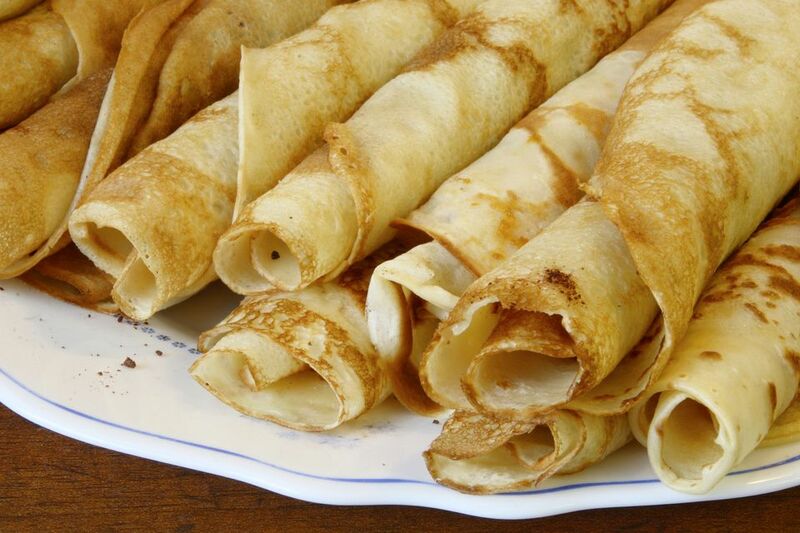 Palacsinta is similar to French crepes, Polish naleśniki, and Croatian / Serbian palacinke. See this sweet palacsinta recipe for sweet fillings. When they are stacked to form a cake, it is called rakott palacsinta. In a medium mixing bowl, combine eggs, milk, club soda and water. Stir in flour, sugar, salt and vanilla to form a smooth batter. Heat a teaspoon butter in an 8-inch skillet. Use a small ladle to add enough batter to coat bottom of the pan in a thin, even layer, rotating pan as needed to cover. Cook for 2 minutes on the first side and 1 1/2 minutes on the second side or until the pancake is lightly browned. Remove and keep warm. Repeat with remaining butter and batter. Fill with your choice of scrambled eggs with mushrooms, creamed meats, seafood or vegetables. Roll or fold into a triangle and garnish with a savory sauce of choice and a sprinkle of chopped chives, if desired. They also can be formed into a "beggar's purse" to resemble a tiny money bag and tied with a blanched chive.